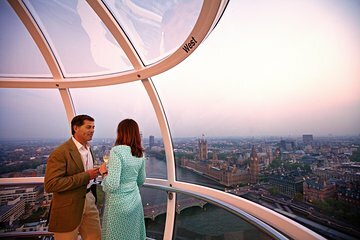 Travel independently to the Coca-Cola London Eye near the Thames River, and take in this 443-feet (135-meter) high observation wheel. The Eye has hosted more than 3.5 million passengers since its opening in 2000 — an average of 10,000 a day. This popularity means entry lines are long, with waits of an hour or more common in peak season. Save yourself wait time with this skip-the-line ticket that includes a glass of Champagne during your flight. Enjoy priority boarding to your shared capsule — an air-conditioned glass pod for up to 25 passengers. As your 30-minute flight begins, sip on a glass of Pommery Brut Royal Champagne (non-alcoholic alternative available), served by your Champagne host. Children will be served fruit juice. Then, soak up the sweeping vistas of London: the views can extend for 25 miles (40 kilometers). Perhaps use your mini-guide to identify landmarks such as St Paul’s Cathedral and Buckingham Palace and enjoy your Champagne along with personalized attention from your host. 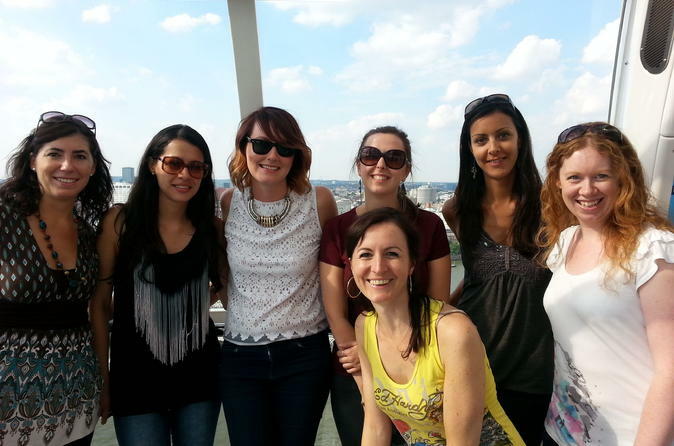 Either before or after your flight, visit the London Eye 4D Experience. Featuring a spectacular 3D movie and special effects, this immersive 4D experience is included in the price. Aim to arrive 30 to 40 minutes in advance to enjoy it, or visit at your leisure after your London Eye flight. Your activity ends after your flight or 4D experience, depending on which you enjoy last. Wasn't super excited when I booked this but was delighted to have a FANTASTIC time!!!! I loved the VIP service, no que, champagne in the eye and our host took many great pictures! Great experience! We were directed to wait in the Eye Lounge where it was air-conditioned and had a bar which we enjoyed. Then we skipped the line with our host Jennifer where she served champagne while answering any questions anyone had about London. Great experience! This is a no brainer for anyone wanting to go on the London Eye. Even without the Champagne just the fact that you go to the front of the crazy long line and then only have 20 or so people in the car with you makes the experience that much more enjoyable. This was quite amazing and the only way to ride the Eye! Skipping the line and the VIP lounge were completely worth it! This is the only way to go the London Eye. You skip the crowds and line and are in a small group. They will help to take pictures of you and the champagne is pretty decent. Great way to skip the line and enjoy the amazing views! Our hostess Anita was very friendly and a wealth of knowledge.